In the past, I have refused to pick up a series unless I can get all the books in that series. Because there's little worse than starting a series and then not being about to find the rest of it. However, because I can now order books on-line, and have them delivered to my door at little or no additional cost, I realized that I can start taking a chance on a single book, with the knowledge that I can order the rest of the series even if I can't find the books locally. So, I picked up The Thief's Gamble because it looked interesting (and also because the series is completed). I was quite pleased to discover that I liked and enjoyed the book, and am looking forward to the rest of the series. The book has several things to recommend it. First, the story is engaging, and drew me in quickly--I wanted to know what happened. Second, I liked the characters. For some unknown reason, I'm particularly fond of reading about thieves and assassins, so a main character who is a thief is right up my alley. Thirdly, although this book is part of a series, much of the storyline wraps up, so that I'm not left hanging as to what is going to happen to the characters. Juliet McKenna makes you want to read the next book not because you have to find out how the characters get themselves out of a fix, but because you want to read more about the characters. Kudos for that, and if the remainder of the series follows the same pattern, she'll be high up on my favorite authors list, just for that. As for the story, Livak needs to make a quick buck so she can keep waiting for her sometimes partner who was supposed to meet her days earlier. Livak is a gambler by trade, and sometimes a thief by necessity, and it's thieving that she uses to cover her stay at the inn. Unfortunately for her, trying to sell the goods gets her more than she expected. Although The Thief's Gamble is not a short book, it is a relatively quick read. We aren't bogged down with excessive details, but instead have an adventure that moves right along. My only issue is that in the beginning, too many characters were introduced at once, and I had a hard time keeping them straight. When she introduces the mages back in Hadrumal, there are several of them (four? five?) all in a room, and I absolutely could not keep straight how many mages there were in the conversation, who said what, and which mage was which. In fact, even towards the end of the book I was still having difficulty keeping a couple of the mages straight. However, these mages were, for the most part, peripheral to this story, and I did not have problems keeping the rest of the characters straight. And by the end I was better able to recognize several of the mages. Additionally, I liked the cover. It wasn't anything special, and the heroine is drawn with the wrong color hair, however she's dressed in reasonable, realistic clothes--boots, leggings, tunic, and cloak. And the long knife/short sword she's holding looks like a perfectly serviceable weapon that she could easily manage. Good job! So it was a good story, with good characters, and fun to read. Definitely one that I recommend. 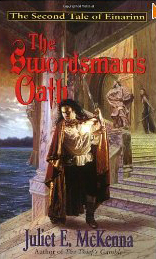 The Swordsman's Oath is the second book of Juliet McKenna's Einarinn series. Ryshad, at the bidding of his Lord, searches for information about the Elietimm and their unfamiliar magic. Viltred, who knew somewhat of the Elietimm isles, has scryed and seen visions of either death and destruction or security, and so joins Shiv and Ryshad in their quest, and determines that they need to convince Livak the gambler to join them. 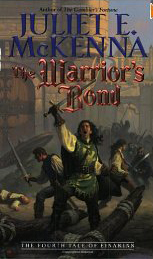 In The Thief's Gamble, the story is from the point of view of Livak, while in The Swordsman's Oath, the point of view shifts to Ryshad, warrior and sworn man to Messire D'Olbriot. I really enjoyed this story, although I am still somewhat unsure about how I feel about the whole slave issue. Is it realistic, how things worked? I'm still not sure. It worked as a plot device, but I'm not sure how much I believed it. Again, the characters and the writing were good, and I particularly like Ryshad. He's an interesting character, and I find him believable. I also like the way that the story ranged all over--what may have been an entire story in other books was just a small part of the story here. Additionally, the story was again completed in a single book. Although there are major issues that are unresolved, drawing you to read the following book, there is a major sense of satisfaction upon finishing the book, and I wanted to read the next book because I am enjoying the characters and the writing, not because the author has left me hanging. So, good writing, interesting characters, interesting story. A good second story in the series. 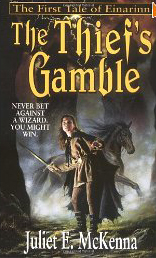 The third book in Juliet E. McKenna's Einarinn series, The Gambler's Fortune was a mixed bag for me. Some parts of the story I liked very much, other parts I did not like very much at all. In The Gambler's Fortune, the point-of-view switches back to Livak, who is searching out the past and history of the Artifice sorcery in an attempt to learn more to hold off the Elietimm, as well as to gain enough coin that she and Ryshad can retire in peace, together. She goes on her search with Usara the mage, and her friends Sorgrad and Sorgren, Mountain Men who work in the lowlands. As with the previous books, I enjoyed the story and the characters, and the plot kept me reading long past my bedtime. I really like Livak, and think that Juliet McKenna does a very good job keeping her true to how she gets things done--often not in a legal manner. What I did not enjoy about this book was the subplot about the Mountain Men (not Sorgrad and Sorgren). I understand that telling their story was necessary, but I really disliked Jeirran, found it hard to find any sympathy for him, didn't want to read about him, and found myself skimming through parts where he appeared. Perhaps if the focus had shifted a tiny bit more towards Keisyl or Teiriol I might have found those parts easier to read, but as it was I disliked Jeirran so much that I just didn't want to read about him, regardless of how important he was to the story. Luckily, the rest of the book made up for the subplot. I really liked Sorgrad and Sorgren, and I like the discoveries that Livak makes about the Artifice and the Forest Folk, although it seems to me that her discoveries should have impressed people far more than they did. As it was, people seemed to ignore or gloss over her discoveries, which I found odd. Although I didn't like this cover anywhere near as much as the cover for The Thief's Gamble (parts of it are a little too odd) I still love that fact that Livak is dressed reasonably, with the exception of her hair. (Running around in the forest with loose hair is a recipe for tangles so bad that you have to cut out the knots.) You can tell she's female, but she is dressed for the type of adventure she's having. I hope that this trend in fantasy covers continues. Additionally, as with the previous two books, the book ends well, with the current story resolved, while the mystery of the Elietimm remains. In summation, this is not my favorite book in the series, however, the writing is still strong, and aside from Jeirran, I enjoyed the characters immensely, as well as the story. I'm looking forward to the fourth book. The fourth installment in the Einarinn series, The Warrior's Bond switches back to Ryshad's point of view, and occurs at approximately the same time as the previous book, The Gambler's Fortune. As far as my enjoyment of the story, this book had one major failing. Politics. Ryshad has returned to House of D'Olbriot and is serving by assisting Temar D'Alsennin as he returns to the mainland for the first time since being reawakened after his long, enchanted sleep. Temar must navigate the political waters in a land that has changed beyond his recognition. Although the machinations of what was happening back at court are important to the story, I just didn't find it as interesting to read about. Politics may be important, but it's not necessarily exciting. And the final fight seemed tacked on, almost as an apology for the fact that this book staring a swordsman involved very little sword work. However, the characters are still interesting, and Temar is growing and taking responsibility for his colony and those he must care for. And I like the way that Ryshad is caught between his oath to D'Olbriot and his duties to Temar. I realize that the events of this book are important to the storyline, but I just don't find them as interesting as the intrigue that Livak is involved in, in the previous book. That doesn't make this a bad book, just not one that particularly fascinated me. I am hoping that the final book has lots of actions and adventure, and a little less politics. And finally, I hate the cover of this book. I can't stand it when the artist decides to depict one of the last stinking scenes in the book on the cover. Gah. The fifth and final book of the Einarinn series, The Assassin's Edge tells of how Ryshad, Livak, Temar, and others seek to finally make Kellarin secure against invaders from the Ice Islands. This is, far and away, the best book of the series. Juliet McKenna does a wonderful job wrapping up the story, and her pacing for this story is absolutely fantastic. The point of view is again Livak's but there are so many loose ends to tie up that we don't spend the majority of the book with Livak, but jumping back and forth from place to place as events occur. And I'm glad that she brought back Sorgrad and Sorgren. Although they started out as only minor characters, they're a lot of fun to read about. The only fault I can pick with this book is one that occurred throughout the series, but was more pronounced here, and that is that it is very difficult to judge how much time has passed when we move about in space and time. Sometimes it's a couple of hours, sometimes it's a couple of days, which can be a it disconcerting. However, besides that, she got everything else just about perfect in this book. By this time we're familiar with almost all the characters, besides the handful she introduces, and we know what has to happen for the story to conclude, however we don't know how things are going to happen, and who--if anyone--is going to survive. This series got so many things right I think. Each book concluded the story that was told within, while adding to the overall tale that weaves through the entire series. I cannot say enough how much I like and appreciate that. The characters are strong and I enjoyed spending time with them. And the story was interesting, fun, and well told. I also appreciate Livak's growth through the series. At the start of the series she seems most focused upon her own self-interest, and the interests of her close friends, however by the start of The Assassin's Edge you can see how she has started to become part of the community at Killarin, and that Ryshad has smoothed some of her roughest edges down, just a little bit. I also enjoyed seeing the changes in Temar and Allin. Especially Allin, as Allin, as she changed from the meek creature brow-beaten by Casuel to a woman capable of standing up for herself, and who is valued in her own right. This is definitely a series that I will reread in the future, and is also one that I will recommend to Michael, and I bet I already know who are going to be his favorite characters.